This week's writing challenge from Five Sentence Fiction ( Lillie McFerrin Writes ) is based upon the prompt "abandoned." It wasn't supposed to be like this – a boyfriend leaving without a word, parents that wanted nothing to do with her, and another helpless life stirring within, just beginning to show. Her grandmother, who lived upstate and the only one who had ever seemed to care, might be her last chance for a safe place to stay until she could figure things out. She heard there was a train station on the other side of Johnsonville, and had walked most of the morning to get there, praying she had enough money left to buy a ticket. 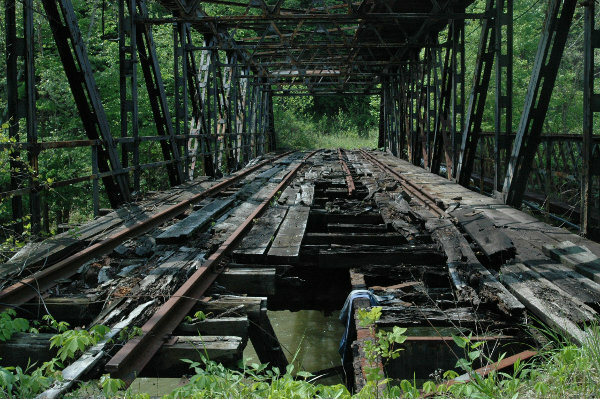 But when she reached the depot and saw it hadn't been used for years, Cindy May Wilkes just kept going, crying as she stumbled along the rusted and overgrown tracks, her arms wrapped around her stomach, past the crossing at East Street, by the boarded-up factory, and halfway across the old bridge over the Watauga River. This sounds like the beginning of a good book. I like it very much. It has a lot of emotion. I've noticed a number of these little stories that I've posted, and have read by the other FSF posters, could be the start of a longer story. Someday, I might go back over them and pick a couple to expand upon. Oh boy, leaving us wondering whether she got further than the middle of the bridge! I'm not sure she did...heartbreaking and desperate situation, great writing as always! Sadly, I knew a girl many years ago who found herself in a similar situation, and I used that as a basis for the story. Fortunately, she's still around today. It's hard to say how Cindy will end up, but she's not feeling too good about her future right now. If I get the right prompt, maybe I can figure something out.